People have referred to life as many different things. A journey, a process, a ride, a roller coaster, a course. So many different ways to try and adequately describe the ever-changing but constant thing we call life. It is full of so many different experiences that leave us with all kinds of impressions, which explains all of the different sentiments we are left with. Nevertheless, life is a journey. It is a process and a wild ride, often resembling that of a roller coaster. And it is definitely a course, one that we either pass or fail. In life we often find ourselves in a battle. I dare say we are always in a battle. What I mean by that is, there is always something we are, or at least we should be, fighting for. We may not be taking blows to the head, but we should be throwing some punches of our own, because our life, our future, our family is at stake and they are all worth fighting for. many of the battles we feel like we are losing in life are not the result of God abandoning us, they are because we didn't start throwing punches until the third round. Too often I have not felt the need to fight for something until it was already being taken from me. Can you relate? You didn't start fighting to find joy in your life until you were feeling depressed. You didn't fight for your marriage until you felt it falling apart. You didn't fight for that friendship until it began to dissolve. I know I am guilty. You may feel like you are operating more as a firefighter than anything else, putting out fires as they appear. I know there have been times in life when I felt like that was really all I could do. I didn't have time to deal with non-emergency issues. I didn't have energy to invest in something that wasn't going under. I didn't have the fight in me to throw punches, all I could do was hold my hands up to my face and hope the gut punches didn't do too much damage. Wow. How contradictory that is to the life God has called us to and has created for us! We have to fight for love. Loving relationships take work. If we aren't fighting for them we are working against them. We have to fight for our dreams. Making dreams a reality takes hard work, it takes a fight. We have to fight for our faith. There are many opponents who will cross punch us with doubt and discouragement. We have to stay in the ring and fight back with the truth, with our complete trust in God. We fight for a lot of things. And to even get in the ring prepared to fight takes guts. But we can't wait until a fire a fully ablaze to start defusing it (you are thinking of essential oils now, aren't you? d:). I have heard it said we must be looking for smoke not fires, meaning don't wait for disaster to strike, fight to prevent disaster and to maintain healthy, growing, thriving lives. As you may know we ladies discredit ourselves more than anyone else, and we have got to cut that out! You may not be putting up the best fight in life right now, but if you are in the fighting ring at all you clearly are brave. If you are not in the fighting ring I hope and pray you will find the courage to get in and to fight. You see, in life there is no neutral ground. If you aren't fighting for your life that doesn't mean the fight is not happening. Even if you are hiding in the dark the fight is on. If we are not intentionally working, fighting, growing, it is like taking a puzzle and dumping the pieces on the table hoping all of the pieces will fall into their appropriate place. It won't happen, friend. Today I want to encourage you to fight with courage. Don't run from difficulty, fight it. As C.S. 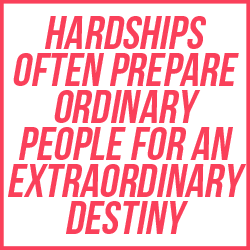 Lewis articulated, difficulty and hardships don't define you, they refine you. Face the hard things with courage. Fight for what is important with courage. If you feel like a fighter who is hiding in the corner of the ring, looking for someone to tag in and go a few rounds for you, have courage. Turn around and face the battle because it is yours for the winning. Have courage, because you are never in the ring alone. God is in your corner, He is by your side, He is fighting for you, and we are here to fight with you! You've got a champion on your side. 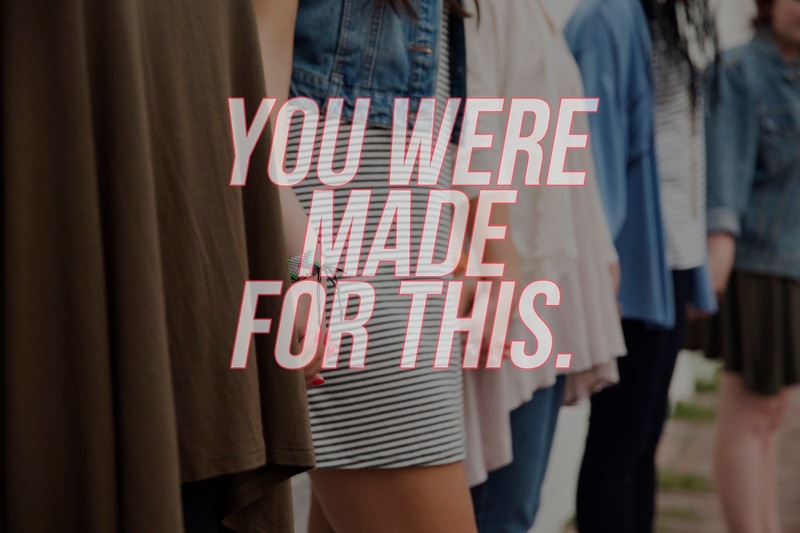 You were made for this.